Believe it or not, caffeine is the most widely used drug in world, according to a 2013 review in the Journal of Caffeine Research. While there are some definite perks that come with consuming caffeine, you may be wondering if drawbacks exist as well. Some studies have linked caffeine consumption with effects on vitamin D, and the Centers for Diseases Control and Prevention (CDC) notes about 10 percent of Americans are deficient in this nutrient. Therefore, knowing the facts about caffeine and its effect on vitamin D is beneficial for your health. Does Caffeine Affect Vitamin D? The link between vitamin D and caffeine isn't entirely clear, but some studies suggest too much caffeine may affect vitamin D levels in your body. Results conflict, though. One study published in the Journal of Steroid Biochemistry and Molecular Biology found caffeine intakes higher than 300 milligrams daily may lead to bone loss due to effects on vitamin D receptors in the body. However, more research needs to be done in this area. Other studies show caffeine doesn't affect vitamin D, and one 2012 study published in Nutrition Journal found teenage girls who drank 9 to 12 cups of coffee weekly had higher blood vitamin D levels than teens who drank less coffee. While the type of vitamin D measured in this study is generally a good indicator of overall vitamin D status, researchers note high caffeine intakes can lead to body fat loss, which immobilizes vitamin D stored in fat cells releasing it into the bloodstream. Therefore, more research is needed to help determine if caffeine increases, decreases, or has no effect on stored vitamin D levels. Does Caffeine Cause Vitamin D Deficiency? Based on research studies examining specific effects of caffeine on vitamin D, it appears caffeine doesn't cause vitamin D deficiency. But, getting too little dietary vitamin D paired with limited sun exposure can lead to deficiency -- and unpleasant side effects associated with it. Vitamin D, along with calcium, plays a crucial role in maintaining healthy bones. But results of studies examining effects of caffeine on bone health again are mixed. One 2013 study published in the American Journal of Epidemiology found drinking more than three cups of coffee daily is associated with slightly lower bone density (2 to 4 percent lower than participants who drank less than one cup daily), but high-volume coffee drinkers don't have increased risks for bone fractures. The slight reduction in bone density could be due to caffeine's effects on calcium. The National Academy of Sciences notes caffeine slightly increases calcium excretion, lowers calcium absorption, and can lead to bone loss in people with low calcium intakes. 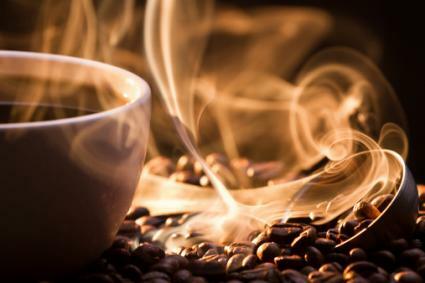 However, some studies show caffeine is beneficial for bone health. A 2016 review published in Plos One found study participants with higher coffee intakes had lower risks for developing osteoporosis. Another study published in 2009 in Nutrition Research found tea, which contains caffeine, appears to improve bone density and decrease the risk for bone fractures. While caffeine doesn't appear to cause vitamin D deficiency, guidelines exist to help you maximize bone health. Linus Pauling Institute suggests limiting caffeine intake to 300 milligrams daily (equivalent to three cups of coffee) and ingesting plenty of calcium and vitamin D to reduce the risk of osteoporosis and bone fractures, especially in older adults. Whether you drink caffeine, make sure to get plenty of dietary vitamin D (and calcium) to prevent deficiency and maintain strong bones. The recommended dietary allowance (RDA) for vitamin D is 15 micrograms (600 IUs) daily for adults and 20 micrograms (800 IUs) per day for adults over age 70. Consuming foods high in vitamin D can help ensure adequate intake. Vitamin D supplements and sunlight are other ways to get your daily dose of vitamin D.
Based on available research, the amount of caffeine you drink likely won't significantly impact vitamin D in your body. If your vitamin D levels change slightly from ingesting large amounts of caffeine, it likely won't be enough to be harmful for your bones. However, if you want to be on the safe side, limit caffeine to 300 milligrams daily -- and be sure you're meeting daily vitamin D requirements.